This is how I embedded Python in my C++ projects. My goal was to have a console that would take in Python in a REPL fashion. I also wanted plugins in Python that use an embedded Python module; embedded inside the program. I will also show you how to make such a module and add it to your embedded Python console. 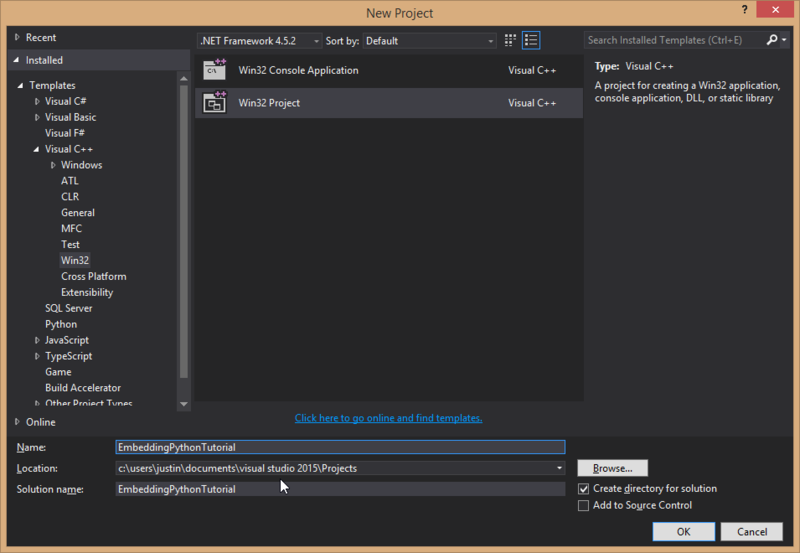 Get Visual Studio 15 Express for Desktop from Microsoft’s website. Get 7-Zip for extracting compressed files. Get Python 3.6. Windows x86-64 executable installer. Install Python 3.6 to “C:\Python36”. This provides all the header files you need to reference in our project. It also has the “python36.dll” you will need to copy to your project. You also need the Windows x86-64 embeddable zip file. Extract the Gzipped source tarball to your ‘C’ directory. You should now have “C:\python-3.6.0-embed-amd64”. This has the standard library pre-compiled in a ZIP file. The pre-compiled ZIP file can be used to include with your project when you ship it. 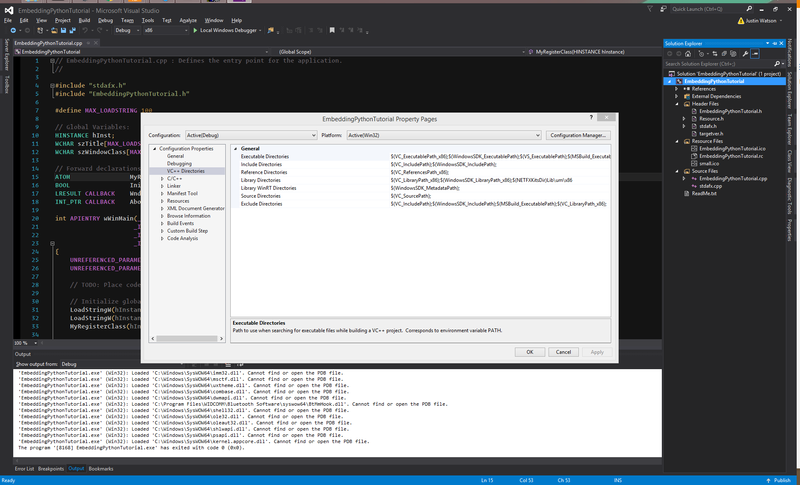 Copy “C:\Python36\python36.dll” to “C:\Users\Justin\Documents\Visual Studio 2015\Projects\EmbeddingPythonTutorial\EmbeddingPythonTutorial” if this directory does not exist you just need to run the program in debug mode once and it will be created. // even when in debug mode of this program. This gets around Python trying to use debug code even when you use your project in debug mode. Our project only uses the 3.6.0 release version. This tutorial is not for compiling Python. We are pulling the header file “Python.h” from the directory you just added to “Include Directories.” The “Python.h” file has all the Py_ functions you will need for this project. Your code should look like the following. I have included some code before and after for you to find the correct location. Now you also need to close up Python when your program finishes. To do that add a call to Py_Finalize before the return statement in wWinMain. When you end up sending your project out it would be nice not to have to require the user to install Python 3.6. Well, they do not have to. You can include the default Python libraries as a ZIP file in your program. Set the library path for your embedded Python. This code goes inside the function wWinMain above the line Py_SetProgramName. I have mine setup like the following so that when I am debugging the project the program is using my local libraries instead of the pre-compiled libraries inside of a ZIP file. At this point you should run the project to make sure you got all of our settings correct and all of our files in the right place. Note the path used if the program is not in debug. It will be the file “python36.zip” you must copy that file from “C:\python-3.6.0-embed-amd64\python36.zip” to the same directory that your executable is. You must also ship the file “python36.zip” with your program and the python36.dll in order for it to work on someone else’s machine. Everything should look like this project at this point. Now you will add code to make Python work like a console. In order to do this you will need to do a little Win32 programming. You need a text box to enter text for the Python console. You need another text box for the Python results. Now run the program. You will see a text box near the left side of the window. Click in it and type. That is where you will insert Python code for your Python Console. Next you will add the output text box. The output text box will be able to display multiple lines. Add the following right after the input box decleration. Now add this code next to the code that created the input text box. Run the program. You should see a grayed-out text box below the input text box. This is our output text box. Sending the input to the Python interperter requires knowing when to take the input from the user and send it to the Python interperter. You are going to use the enter key. // Change the window procedure for the input text box. Near the bottom of the file, below the function About() add this window procedure. 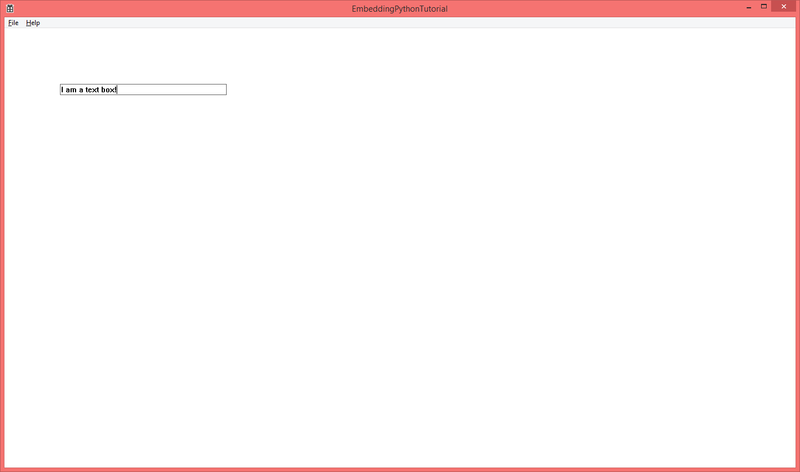 // Custom input box window procedure. // This is to trap the enter key. to the globals section near the top of the file. Now run the program. Type some text into the text box and hit the enter key. The text should disappear. That’s how you know your window procedure is capturing the windows key. To send the input to the Python interperter you must call it with [PyRun_String](https://docs.python.org/3.4/c-api/veryhigh.html#c.PyRun_String). You can’t spend to much time in the GUI thread though doing any long task. If you do your program will hang and people won’t want to use it. To overcome this you will put the input in a global variable and set an event for a seperate thread to know there is new input ready. Include #include <process.h>. Add that line to the top of the file. This provides the functions _beginthreadex and _endthreadex. 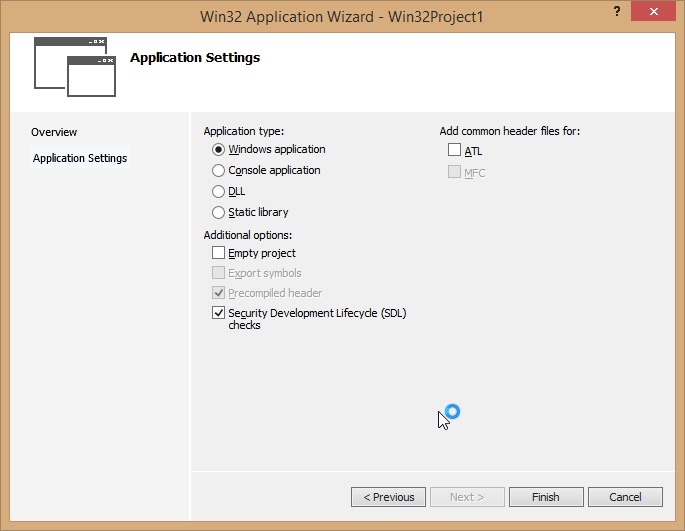 In the wWinMain function add the following just after the call to Py_InitializeEx(0);. // Start the Python input thread. In the forward declerations section add the PythonThreadFunc prototype. Add code to close up the Python thread right before the code to close Python. // Stop the Python thread. Now you will add the code for the Win32 event. The event will hold the Python thread in a yielding state until the event is set. Then the Python thread will run its code. The event lets your thread know there is data ready to be parsed by Python. The data came from your input box. If you don’t use the Win32 event system and just loop your program will eat all of your CPU. Always follow your system’s event/scheduling mechanisms. That way your CPU isn’t just hogged by a loop. You will add code in a few places to get the event set up. Add code to the section “Python Interperter Variables” at the top. Initialize the event in the wWinMain just before the Py_SetPath function. Since our thread will be waiting for this event to run you need to set the event when you are trying to close the program so the Python thread dies gracefully. In between where you set the g_python_thread_done = TRUE; and where you close the thread handle (CloseHandle(g_python_thread_handle);), set the event and wait for it. The code should look like this. Inside the PythonThreadFunc add the code so that the event system waits for your new Python inpute event, g_python_input_event. The code goes inside the while loop. If you set this event in order to close the thread the thread needs code to check for that and end gracefully. // for the "event" to happen. Now you need a variable to hold the Python input data when the user hits the enter key. At the top create a varible named “g_python_input”. In the InputBoxProc you need to uncomment the two lines that were commented out when you first wrote code there. One writes the text from the input box to our global Python input variable. The other line sets the event that you use to tell the thread new input is available. // console in the output box. // Go back to waiting because the input was empty. Hopefully this section wasn’t like drawing a horse. If it was, let me know. It was a big step though in getting the infrastructure you need to handle input and not break the GUI thread. If you entered everything correctly then hitting enter in the input box should make a >>> show up in the output box. Here is the code up to this point. You will now have Python parse the user’s input and return the result. The result can be an error, nothing, or whatever else you can see when using the Python console. This part of the project also takes quite a bit of work. You need to modify the display hook so you can grab the data in a Python variable. Inside PythonThreadFunc add the following code at the top of the function above the while loop. // Setup code to modify the displayhook so I can grab it. You can find more about sys.displayhook and sys.excepthook in the Python documentation. These new functions set the value inside of __main__. You can now grab the results of entering a Python statement by grabbing the data in the variable __result or grab the exception information in __traceback. You will add the code to do this now. Just after the if statement to check in the user’s input was empty append the following code. // Now we need to clear the result. // Return either the result or the traceback. // Clear the python input buffer. Run the program and type the following as two seperate commands. Now enter “z” into your text box. You should see the following traceback in your output box. This means you have our embedded Python console set up correctly. The code at this point is EmbeddedingPythonTutorial_Part4.zip. You are going to make a custom module and add it to your embedded Python console system. You will be able to make calls to the embedded module through your Python input box. // Add the "awesome" exception. All of this code come from following the Python lesson on extending: A Simple Example. More information is in the Extending/Embedding FAQ Refer to this if these documents if you want to keep adding to your module. You can add more variables and functions to your module. Go to your “EmbeddingPythonTutorial.cpp” file. 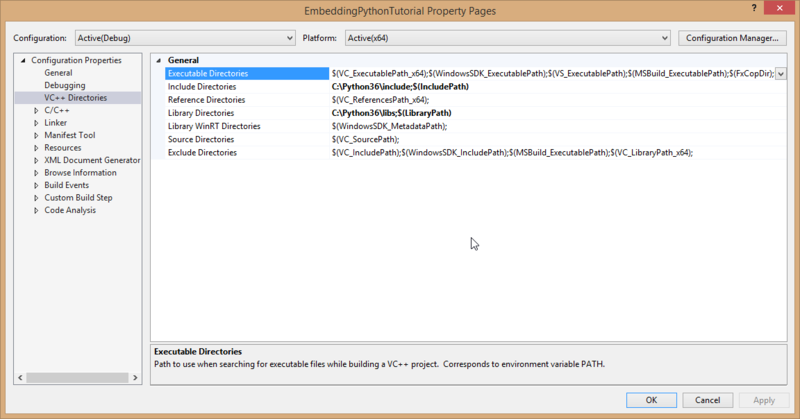 Add the module header file to your “EmbeddingPythonTutorial.cpp” file. Add the following code just below the #include "EmbeddingPythonTutorial.h". Now you need to have Python import the module. Go to where we call Py_SetPath in wWinMain. Add the call to PyImport_AppendInitTab just above it. Now you have the foundation of an embedded module to extend your embedded Python console. The code at this point is EmbeddingPythonTutorial_Part5.zip.